We ADORE making pom poms. 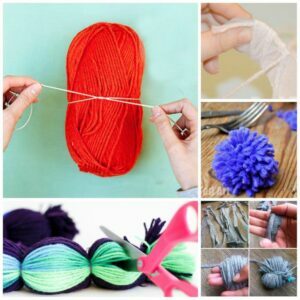 Here is a super simple way of making pom poms with young kids. 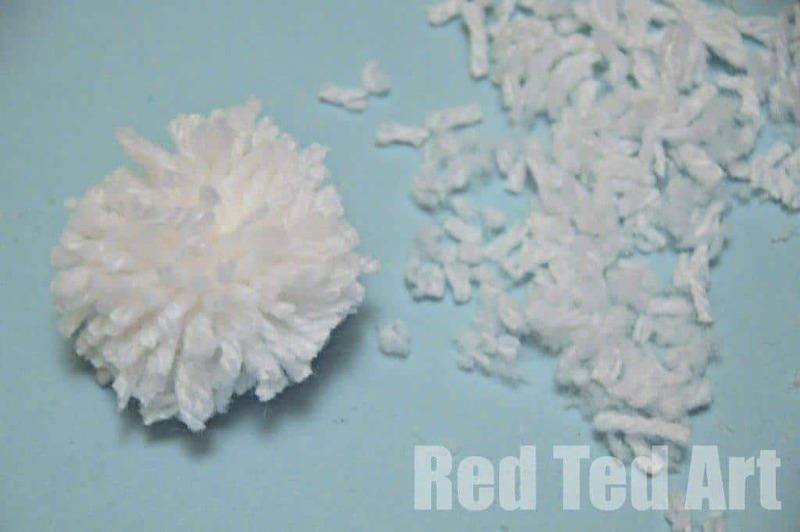 We do have an extensive list of How to make a pom pom technique here for you to browse too! 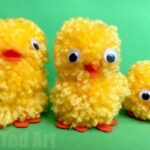 We have may more Pom Pom Crafts & Ideas for you to check out too! 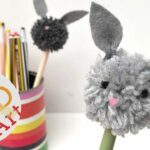 I have been waiting and waiting and waiting to make pom poms with the kids for absolutely ages. I wasn’t sure when they would have the dexterity to do it. 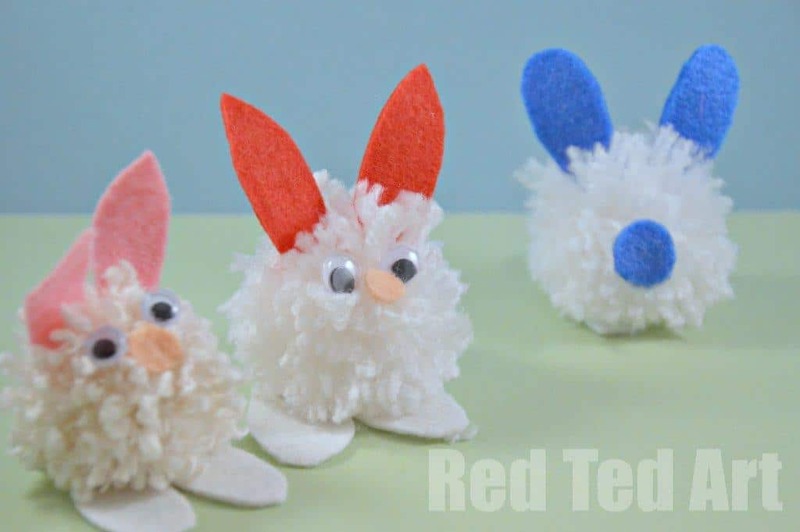 So, when I saw the fun “fork poms poms” making the internet rounds, I thought the same principle could be applied to a piece of card and thus make for really easy pom poms for the kids to manage. 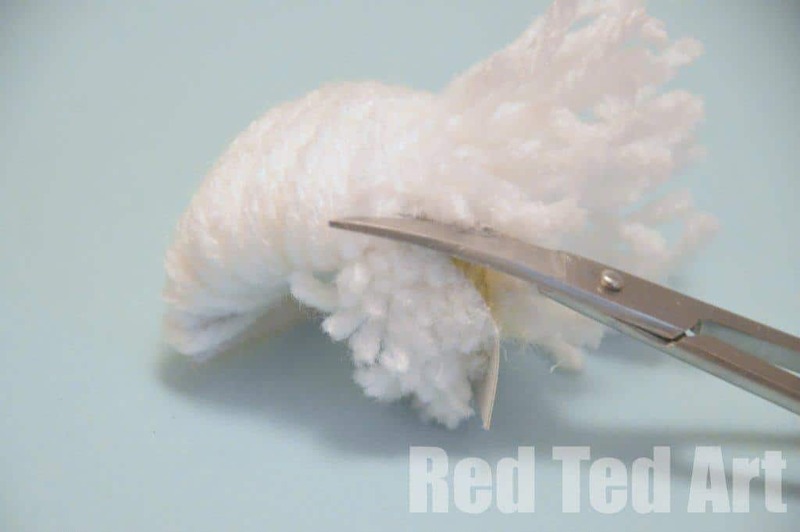 Well, Red Ted (almost 5yrs) JUST about managed, with a little help. 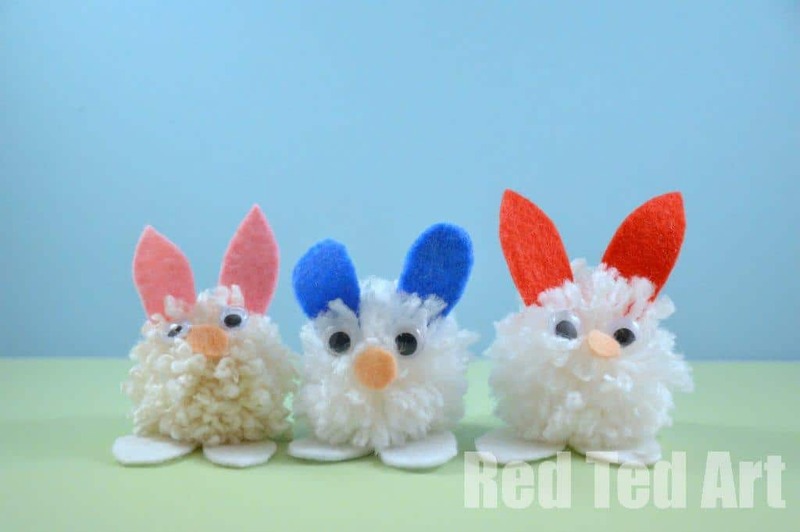 And Pip Squeak (3yrs).. well.. she just played with the bunnies I had already made. So. 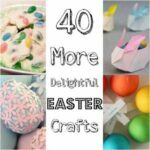 Do make these if you have younger kids, but expect to help them (which I think is totally fine by the way!). 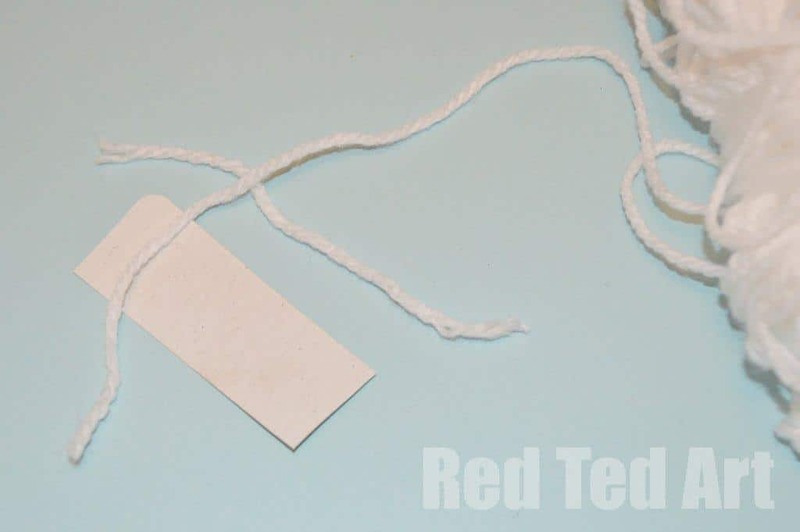 1) Cut a rectangle from your card – remember you Pom Pom will be approximately double the width of your card. We used one approx 1.5cm wide. Then cut a strip of wool to length ways across the card. You will need it later to tie your Pom Pom. Take your ball of wool and start wrapping. 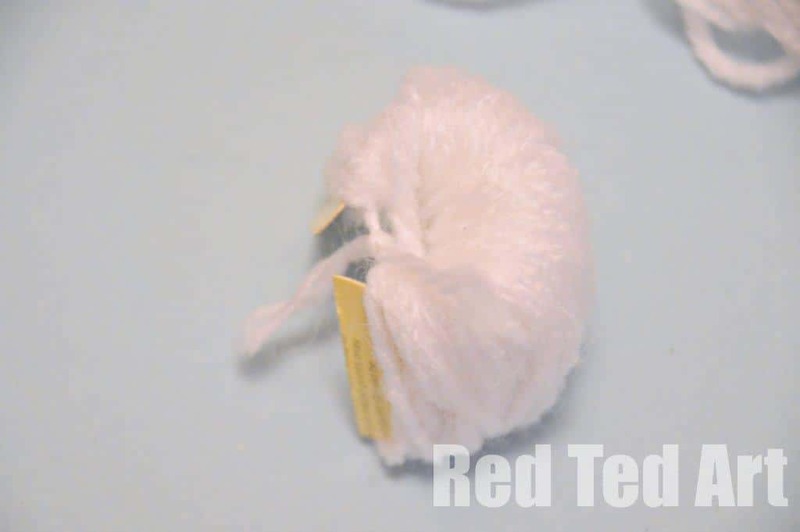 2) Red Ted (almost 5yrs) managed it quite well, though got into a bit of a muddle towards the end of the length. Pip Squeak (3yrs) didn’t get the hang of it, but we will try again! Wrap it round until you have about 3-5 layers of wool. 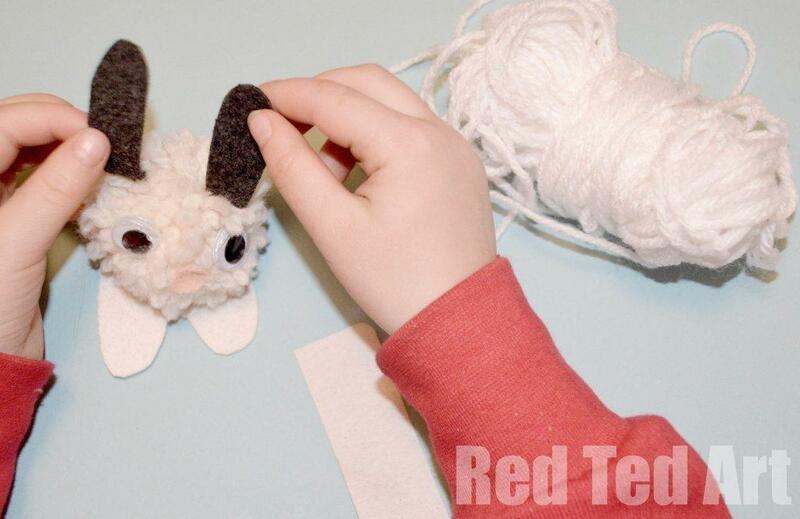 3) Take the piece of wool that went length wise earlier and tie it as TIGHT as you possibly can. 4) Snip the OPPOSITE end with a pair of scissors. We have a pair of nail scissors that we use for crafting. I did this for the children. Once all snipped. I found it best to add ANOTHER piece of wool around the center of the PomPom to make sure that it is really tight. 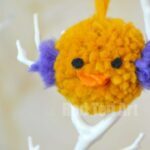 5) Trim your pom pom to make it nice an even. 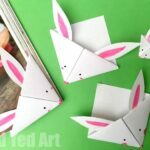 6) Decorate to make a bunny. 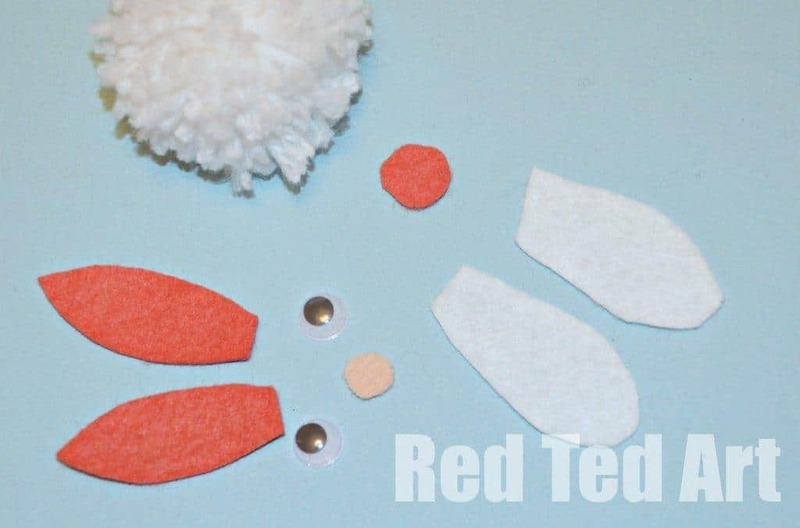 Above shows the shapes we cut out of felt and with lots PVA we glued them all on and let dry. DONE! 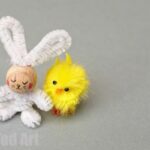 Be sure not to forget your cute pom pom bunny’s tail! I’m just getting ready a post on finger knitting, as she was incredibly good at that – she tells me (at almost 3.5 that she’s “ready for needles now” – I think NOT! H is poorly today, so I reckon we’ll give these a go! Oh hope that H is better soon! My kids are dying to have a go at knitting, but don’t have the co-ordination yet. Will have to start on finger knitting soon!!! Ha yes, there is that problem Emma – I think adding that “second tie” after you have cut it open does help… but do know that to some children this still isn’t a hinderance! I added my finger knitting page I put up, I’m not entirely sure what we’ll make, but it’s fun! 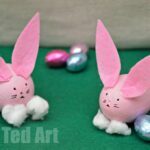 NOTHING wrong with pink bunnies!!!! They are so cute!!! The little tail.. he, he 🙂 We made Valentine’s Day ones that sort of look like these. You’re so talented! 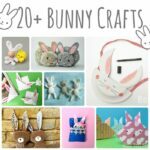 These would be perfect as a go along to the many bunny books we own. In fact glued onto lolly sticks they’d make great puppets! Yup, I’ll be doing this in the not too distant future! Thanks for hosting, and thanks for sending me your badge! These are SO cute! I just love them. Brings up deeply buried yet super sweet memories of doing this myself as a kid. Fantastic ideas for holidays! Even Easter. Those bunnies are great. Thanks for posting the instructions and photos. Do you have any other ideas for kids art sets that could help make these? They are fantastic. Keep posting. Love it. Love the ideas in your party, thanks! Off to go exploring! They are gorgeous! 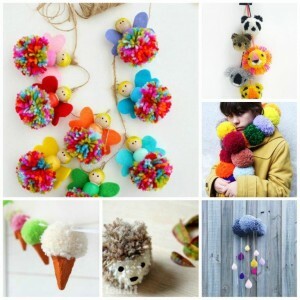 I really want to make pom poms with the kids too, I will have to try your method. These are super cute!! I wanted to make some pom poms and now I have an excuse to! Adorable as always…can’t wait to see if my almost 6 year old can manage this. Those bunnies are just the cutest things ever! Pinned!